I read about soap nuts way back in 2007. They are used in India and other parts of the world as an alternative to soap. Check out this groovy snippet from season 3 of “It’s Not Easy Being Green” which Kim and I often have a good laugh to. Even though we make all of our own soap now using vegetable oil, it would be cool to get my hands on some of these if they were grown locally. Does anyone know where I can get some in the Melbourne area or even via mail order in Australia? This year has been a huge one for my family and I, with more greening activities than ever before. All our goals for this year were achieved in the first half, which was quite an achievement as were all the other additional skills and events we learnt and attended. Debt Reduction – We managed to pay off our personal loan that financed our Solar PV system in May, although we still have $3,000 on the bloody credit card again. Most of it from medical expenses, however we are paying it down quickly and it should be gone in a few months time and be back to zero. Local transportation aka ‘ride a bike’, became well entrenched as did walking around our town on weekends. Although my family has only just begun to embrace this, I have walked to the gym and back every weekend except for those it was raining heavily. I found it refreshing and my workout was half over before I arrived! I have also become a local advocate for public transport, and catch it to work every single day just to prove to others that it is easy and convenient. It is certainly cheaper and less polluting than a car. I ride my bike around town to run small errands, like visiting the library, the pub with my neighbour, and to the chemist if required. By doing this I have found that 50 litres of petrol lasts about a month an a half in my hybrid car, and we rarely have the need to fill it up. Kim has actually dropped fuel as a budget item in our household budget. Soap making became a hobby for Kim and I, with us making a total of 15 kg of soap over the year. We have only used about half of this personally, and have given away many bars as gifts to friends and family. We also held two soap making workshops for our local sustainable living group. Sustainable Living Education – As for continuing my education for sustainable living, this was achieved in about May/June when I helped out the ACF with a series of GreenHome Community workshops in Caroline Springs. I gained a lot from the interaction with others, and even gave a few presentations along the way. Just after these workshops, I thought to myself that I should not limit the education to just this blog, but attempt to educate others through what ever form of media I could get my face in front off. So I chose video and television as the tool of choice, and contacted Vasili from Vasili’s Garden to get on the show, which is, of course history. A couple of printed interviews also occurred, one in Good Gardening Magazine, The Herald Sun, and a few in our local paper the Melton Weekly. Also out of the blue, the 7PM Project ran an article about Frugal and Green living which was well received by the public. I also made a whopping 32 YouTube videos this year in an endeavour to teach people how to make soap, cheese and home brew beer, all worthwhile skills that are hard to come by. Kim and I have been kept busy in our spare time helping to run the Melton Sustainable Living Group. With events and workshops throughout the year, I believe all group members have helped to raise awareness in our community, which from just over a year ago was non-existent. I am proud to be one of the founding members and the President for the last couple of years. We have grown in strength to 23 members who all get along and promote the lifestyle in their own way. One goal which was not listed was our sustainable living group holding Sustainable House Day at my humble abode. In so far as bang for our buck, this was the best education event we had all year. With over 100 visitors on the day, we managed to spread the word that living a sustainable lifestyle in the suburbs is indeed achievable and worth doing if not for the cost savings alone. One other exciting event was participating in the Keep Australia Beautiful – Sustainable Cities awards. My blog was nominated as part of the entry for the Melton Shire Council, and even though I did not win that category, it contributed points towards the overall win of Sustainable City 2010 for Victoria! It was a very proud moment indeed, as was being able to represent our town at the National awards for the state of Victoria. So, was 2010 was a fulfilling and thoroughly enjoyable year with more ups than down? Too right it was! We all had a ball, and kept on living and behaving larger than life on our journey towards a sustainable lifestyle. Most importantly, we had fun. Especially with Kim calling me a nutter on national television! Stay tuned on New Years Day for my 2011 goals. I think they will be a cracker. I am a difficult person to buy a Christmas gift, that I will admit. As you all know I am not into consumerism, and only buy practical, long lasting items that will help us on our sustainable journey. It must be either organic, fair trade, ethical, second hand or renewable or just damn useful. So it makes it really hard for others to buy for me. Well I am happy to say that Kim’s present ticked the boxes this year (as always). 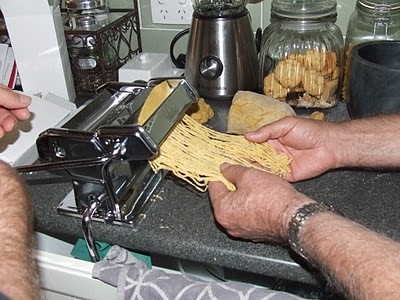 She bought me a pasta machine which is a great addition to our kitchen. 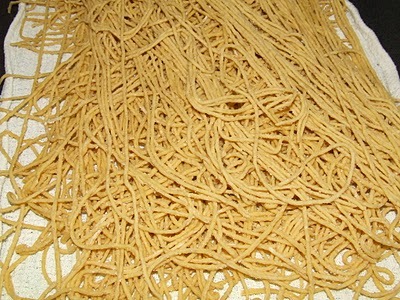 I love fresh pasta, and if made with local ingredients even better. So today, we made spaghetti! 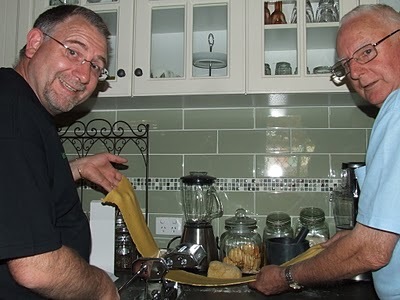 Here is me and my father with the pasta machine testing it out. The recipe was extremely simple. Place 250gms of white flour and 250gm wholemeal flour (local) in a bowl, make a well and crack in 5 eggs (home grown). Mix with a fork until most of the moisture is absorbed them kneed with your hands. The dough should not stick to your hands, and should be even in consistency. This took about 5 minutes. Once the dough was nice a firm, I cut off a small piece and ran it through the machine as per the instructions to clean off any excess oil, which I threw away. Then we cut off a third of the dough, and ran it thought the machine on no. 1. 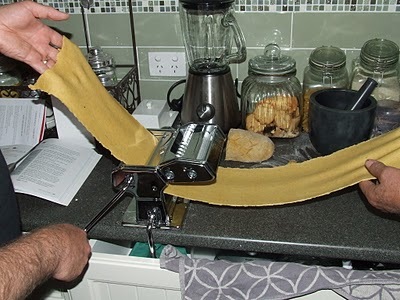 We ran it though at this setting 5 times, adding a little flour each time, then folding the pasta in half, and back through again. It becomes very pliable. Then we ran it thought once on no. 2 setting, then once on no. 3 setting. It was about 3mm thick and about 90 cm long. Just right for lasagne, but we didn’t rest on our laurels. The manual suggested that we cut the sheets into 25cm lengths, but from trial and error we chose to make them about 45cm or about 15 inches. 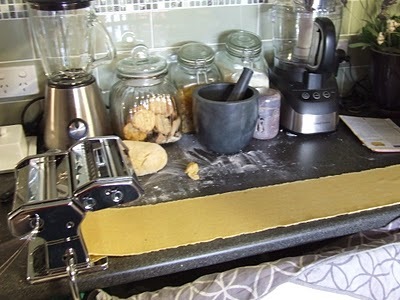 Then we swapped the handle over to the spaghetti cutter and run a sheet through it. It took two of us to make it work. 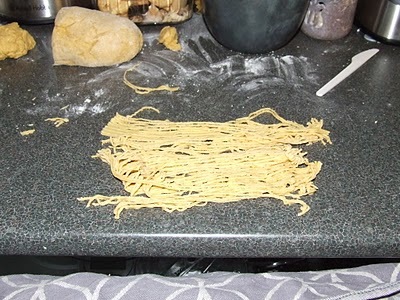 We got better at it as we progressed, and ended up with some very nice spaghetti. We found the first run of 25cm too short. Kim and Norma (Dad’s partner) sat at the kitchen table, pulling the strands apart and laying them on a tea towel to dry. However, this is where we came unstuck. We put too much on top each other and only the top dried sufficiently to be used in dinner. The spaghetti that did dry cooked to perfection. I bought about 6 litres of salted water to the boil, threw in the pasta for 3 minutes, and it was done. I served it with a home made Bolognase sauce which has the following home grown ingredients in it, onions, garlic, basil, oregano, and zucchini. Everyone said that it was the best and freshest pasta they had ever tasted, and I commented that it was a true family affair. What other food do you know that could bring everyone into the kitchen to help out? Tomorrow, I will grab an old broom handle out of the shed, sand it down and then oil it with olive oil. I will use this as a drying rack between two chairs and hang the fresh pasta over the pole. This way it should all dry evenly and be just right. What a great present! Thanks Love x.